BigBasket Refer Earn: Bigbasket is A Online Grocery App And Websites Like Papertap And Groffers. Bigbasket is Running Refer and Earn program in which Every user Will Get 100 Rs. Cashback for Inviting Friends After Friend Made his First Purchase of Rs. 500 or More . Your Friend Will Also Get Rs.100 Cashback. Currently, You Can Use Freecharge Bigbasket Offer To Get Extra 20% Cashback . The bigbasket app is a one-stop shop for all your grocery needs and much more. It provides you a convenient way to buy a wide range of products online and have them delivered to your doorstep. Right from fresh fruits and vegetables, groceries and staples, rice and dals, spices and seasonings to packaged products, beverages, personal care products, meats – we have it all in our online market. Choose from a wide range of options in every category, exclusively handpicked to help you find the best quality available at the lowest prices. Download Bigbasket App From Here . Now Install The app . Click On Signup For New Account . Now Add Items To Your Cart . Tip: Add Product Of Rs. 500 To Get Full Cashback + Referral cashback . Now Proceed To Payment Page And Choose Payment Method As Freecharge or Any . You Will Get Cashback Amount After Delivery Of Your Cart Items. Click on Three Dots From Nav menu . There you will find refer & earn tab. If it is not visible, then just update your app to latest version. Copy Your Code And Share It With Your friends . For Each Successful Invite You And Your Friend Will Get rs.100 Cashback. Referrer is a person who is an existing customer of bigbasket, Referee is a person who is introduced by referrer. The Refer and Earn Program is only valid on new installs and sign ups on mobile apps and Only New Registration on Website. This offer will not be valid for existing users who already have registered/signed up on bigbasket. Referee should use the Unique Referral Code on the Signup Page. Any new registrations/sign up without using the referral code will not be valid for referral reward. Offer not applicable for Speciality and JIT Products purchase value/order value. Each unique referral on their first order from bigbasket is eligible for Rs. 100 cashback only once upon order completion from referee. Offer is valid on minimum transaction value of Rs.500. If the referred customer places the first order below Rs.500 it will not be counted as successful referral. Maximum referral bonus earned via unique referral is Rs.1000 only. In this case only first 10 referrals will only get benefit of the program. From 11th invitation even if the referee completes the transaction of a minimum value of Rs.500 and use the unique referrer code while signing up, the referral bonus will not be credited to any user above 10th referral as the maximum cap on referral bonus earned is Rs.1,000 per referrer. Offer is valid only once per unique Email id / Mobile Number. Unique user Promo code has to be applied to avail the cashbacks for referral scheme. 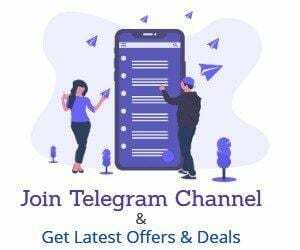 In case you miss entering referral code on the signup page and finished transaction worth Rs.500 to earn the referral bonus. Neither referrer nor referee will receive the Referral bonus. bigbasket is not responsible for this mistake and after the first order is placed referee cannot use the unique referrer code to get this bonus again. 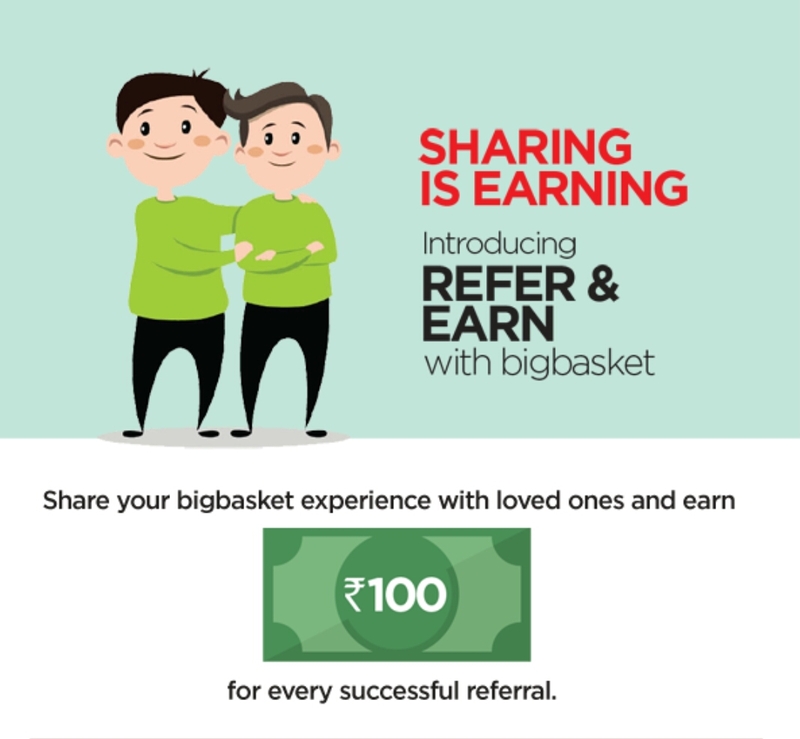 For every referred friend from referrer who transacts on bigbasket App / Website for the first time using your promo code on sign up, both the referrer and referee will get Rs.100 as referral bonus. The code is applicable only on the bigbasket App & Website. For all other queries please email customerservice@bigbasket.com.